The Gold Beach RV Park is located in beautiful downtown Gold Beach Oregon. The park offers guests shopping, restaurants and the “GREAT WILDERNESS” which the Southern Oregon Coast is famous for; all within walking distance of your RV. The beach is just a couple of blocks away, a 15 minute stroll from the park. To add more splendor to your journey…spend a brief 5-10 minute drive North to the legendary Rogue River – and South for some of the most pristine beaches you’ll ever encounter. One of these beaches is the infamous Meyer’s Beach. It is one of the most photographed beaches in the nation and one of the top rated windsurfing sites in the world. Gold Beach is a seaside town, a river town, and a mountain town all wrapped up in one location in the heart of the “banana belt” of the Pacific Northwest. This refers to a climate that is more temperate than other parts of the Oregon coastline with summer temperatures a pleasant 65-70 degrees. Much like a secluded village, Gold Beach offers a variety of activities from adventure to relaxation, leaving the “hustle and bustle” lifestyle. We are located in Curry County which has a saying… “There is no hurry in Curry”. Indeed folks, there is not!!! We offer monthly rates for those who want to embrace our wonderful city. 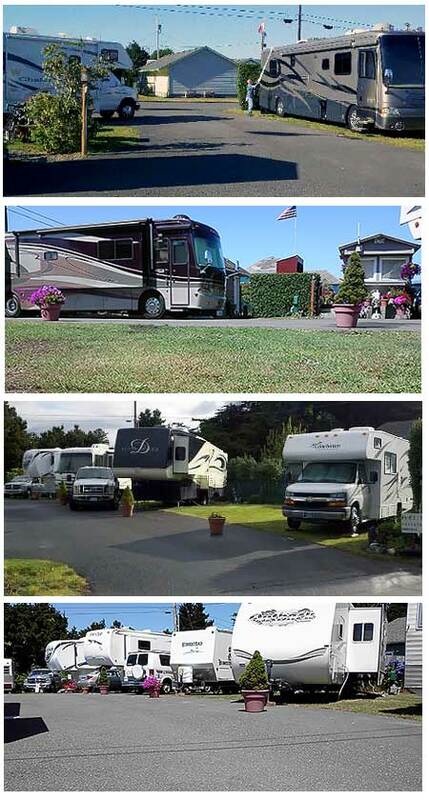 We hope you’ll visit us at the Gold Beach RV Park to experience the Southern Oregon Coast and its hospitality!! Make your reservations now!! **AVERAGE AGE OF OUR GUESTS ARE 50 AND OLDER…! **WE ARE SMALL RIG FRIENDLY (max 34 feet)…!